Most people probably don't want to spend time in a cemetery, since they'll be stuck in one for eternity worryingly soon. 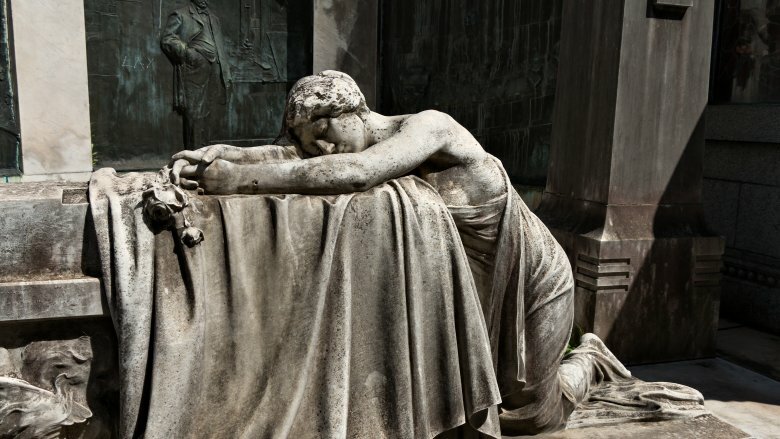 This is a mistake, since cemeteries are not only the easiest place to get close to famous people who have met their expiration date, but they can also be unbelievably beautiful. Sure, the specter of death that haunts your every move while you are in one is a bit off-putting, but once you get past that it's totally worth the trip. Humans are obsessed with dying, which means sometimes they put a lot of effort into cemeteries. Around the world you can find ones that are important to different cultures or religions, some that are full of angry ghosts, or even ones that are meant to be funny. So next time you plan a vacation, be sure to check if any of the awesome cemeteries on this list are nearby. If you believe it's not nice to talk ill about the dead, then don't request burial at Merry Cemetery in Romania. Six hundred late residents of the city of Săpânţa now reside there, each under a brightly colored wooden cross that tells the "warts and all" story of their life and death. According to Atlas Obscura, the tradition was started by Stan Ioan Pătraş. Born in 1908, by age 14 he was carving crosses for the cemetery. Around 1935, he decided to add poems that told a bit about the person's life, as well as an image of how they died. The problem was, he had a very dark sense of humor, and this is absolutely present on the crosses. One epitaph for Ioan Toaderu reminds everyone of his love for horses, pubs, and other men's wives. The town drunk is shown being pulled down into the grave by a black skeleton as he takes a swig from a bottle. A man who buried his mother-in-law informs us on her cross that if she'd lived another three days it would have killed him, and he begs you not to "wake her up" or she will come back and bite his head off. Amazingly, no one has ever complained about the crosses. Until the 1970s, it was a local secret, then a French journalist covered the cemetery and it attracted tourists. 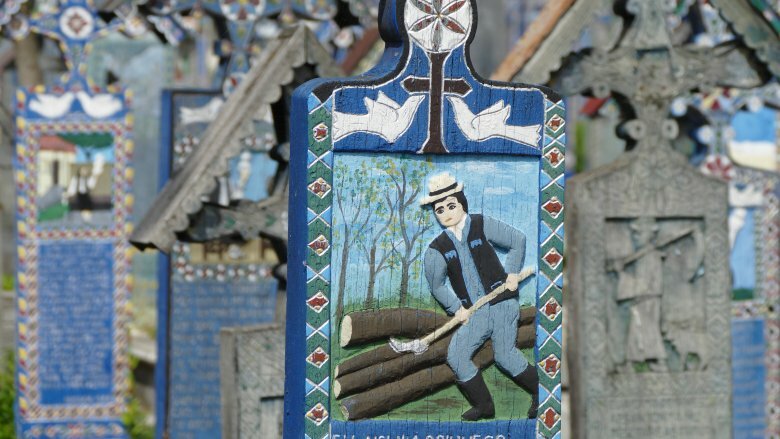 Pătraş died (after carving his own cross) in 1977 and left the work to his apprentice, who still makes them today. Since there aren't usually people at the gates selling tickets, it's hard to be sure what the most visited cemetery in the world is, but it's probably Père-Lachaise in Paris. According to Encyclopedia Britannica, at 110 acres and with 5,000 trees, the cemetery is also technically the city's biggest park, which is part of the reason people flock there. But the other reason is the super-famous dead people. In 1804, residents in Paris were worried about disease spreading to the city from the cemeteries. So authorities started a new one, then on the outskirts of the Paris. To make it the cool place everyone wanted to be buried (to encourage people not to use more centrally located cemeteries) the bodies of Paris' most famous dead residents were moved there. This means that despite being just over 200 years old, there are identifiable bodies of celebrities from the 1100s buried in Père-Lachaise. And the list of luminaries kept growing. These days you can go visit Molière, Frédéric Chopin, Marcel Proust, Oscar Wilde, Sarah Bernhardt, Gertrude Stein, Edith Piaf, and Marcel Marceau, among many, many others. But the most famous resident might be Jim Morrison, who died in Paris in 1971, age 27. 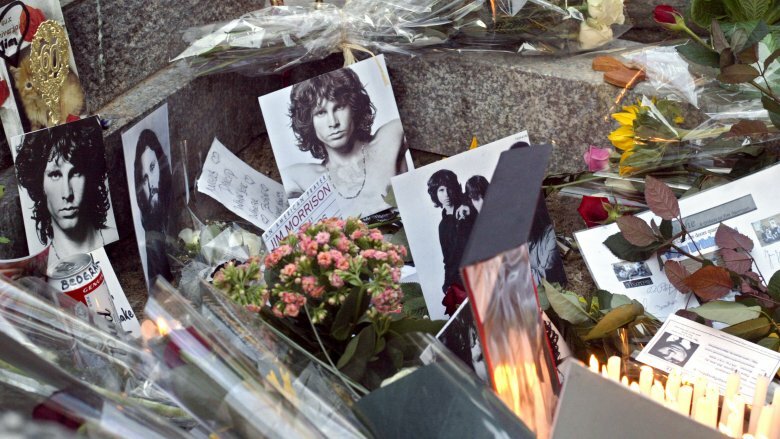 Everyone wants to see where the lead singer of The Doors is buried, and they leave flowers, candles, and occasionally alcohol or drug paraphernalia. In the past, fans threw parties at the grave site, while some of the more determined souvenir hunters have been known to try and steal Morrison's body. If you're Jewish, the holiest place you can be buried in the whole world is the cemetery on the Mount of Olives in Jerusalem. According to its official website, being laid to rest there has some serious perks, even though you'd be dead. Folk traditions say that on the day everyone gets resurrected, people on the Mount of Olives get to come back first. Since they will already be in the Holy Land, they won't have to roll their bodies there like people buried in other locations. And their bodies won't be consumed by maggots, which is nice. This means lots of people request burial in the cemetery, and it's up to about 70,000 graves. Some of those laid to rest there include important scholars and rabbis. 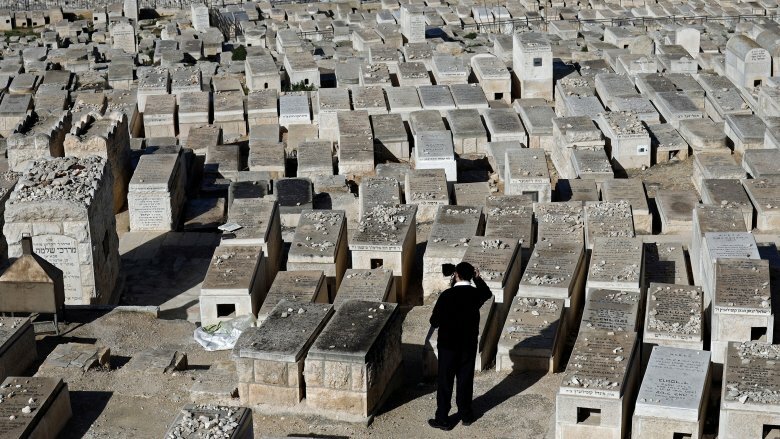 Even if you can't get your body there, it's a tradition for Jewish pilgrims to take some dirt to spread on the graves of loved ones overseas, thereby connecting them to the holy location. Despite all that, the Mount of Olives has only been used as a cemetery for about 500 or 600 years. There was a different burial ground used by Jews on the Temple Mount, but pressure from Muslims meant they had to abandon it in the 1300s. And the difficulties continued after the move. Over the centuries, both Christians and Muslims have purposely destroyed graves in the cemetery. When Jordan invaded, their army caused huge damage and even built a highway through the graveyard. Since then, it's needed major reconstruction work. 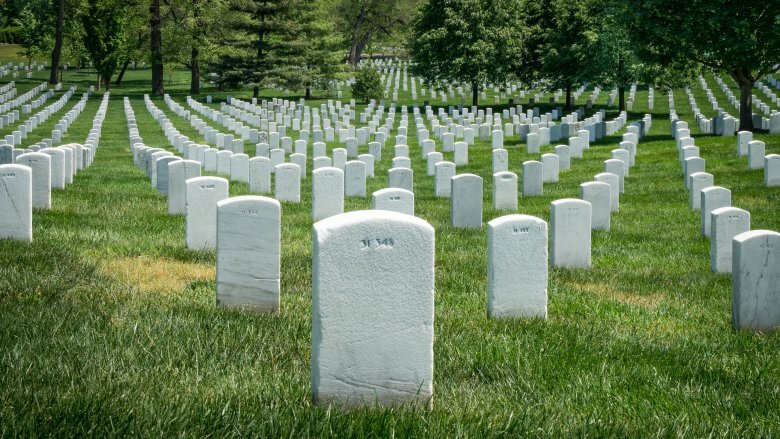 Arlington National Cemetery is a place for somber reflection on the sacrifice of the more than 300,000 veterans buried there, their graves marked with simple headstones. Participants of every American conflict are represented, from the Revolutionary War to Iraq and Afghanistan. But this doesn't change the fact it has a very petty history. According to the National Parks Service, the land was originally an estate owned by George Washington's adopted grandson, who left it to his only daughter in 1857. So far, so good. The only problem was, that daughter had married a childhood friend named Robert E. Lee. The couple lived in the house until the Civil War started in 1861. Then the U.S. government seized the property, and the guy in charge decided to start burying bodies there, so Lee, now a traitor fighting for the South, could never come back to his home. There was a bit of legal wrangling after the war, but the cemetery remained and grew. These days, there are still almost 7,000 new burials a year, so be aware of that when you visit. Obviously, the Tomb of the Unknowns is a must-see, where three unidentified bodies from World War I, World War II, and the Korean War are laid to rest and guarded, rain or shine, by the 3rd U.S. Infantry. (Vietnam's unknown soldier was identified as Lieutenant Michael J. Blassie and removed in 1998.) Presidents William Howard Taft and John F. Kennedy were also laid to rest in the cemetery. Everything and everyone in Hollywood desperately wants to be hip, and its most famous cemetery is no different. But it has totally succeeded, with the Washington Post even saying visitors should skip the Walk of Fame and head to where all the dead bodies are instead. That's because, for a cemetery, Hollywood Forever is decidedly alive. Burials seem kind of secondary to all the events happening there regularly. The Masonic Lodge on the grounds hosts rock concerts and there are frequently outdoor movie screenings that sell out. But after you have a good time, it's worth wandering around the graves with the peacocks that live there. As you would expect for a cemetery in Hollywood, there are a lot of famous people laid to rest in the cemetery. There's still an annual memorial service for the silent film lothario Rudolph Valentino, who died in 1926, allegedly making it the longest-running ritual in Hollywood. His crypt is covered with lipstick kisses from adoring fans. 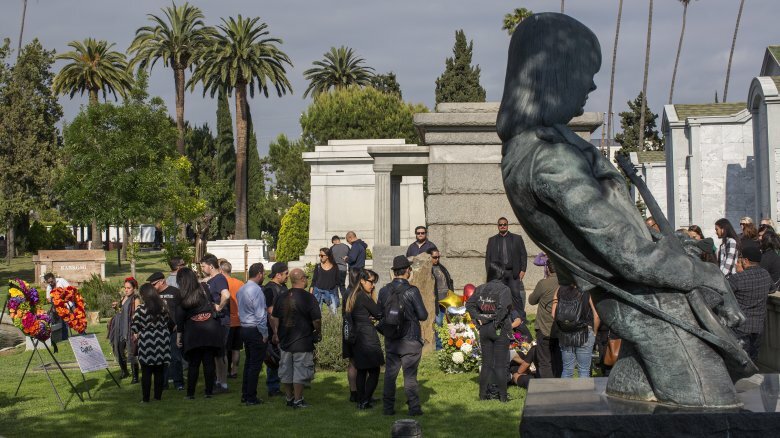 Johnny Ramone is buried under a statue of himself playing guitar. Director Cecil B. DeMille, gangster Bugsy Siegel, and Bugs Bunny voice Mel Blanc are all there. Actresses range from Hattie McDaniel, the first African-American Oscar winner, to Vampira. You'll find cenotaphs for Jayne Mansfield and Toto (real name Terry) from The Wizard of Oz. And so many more, especially famous people from the Golden Age of Hollywood. But even the graves of less well-known residents are usually beautiful and original. If the idea of being buried six feet underground seems creepy and claustrophobic, why not consider immersing your ashes in 40 feet of water instead? 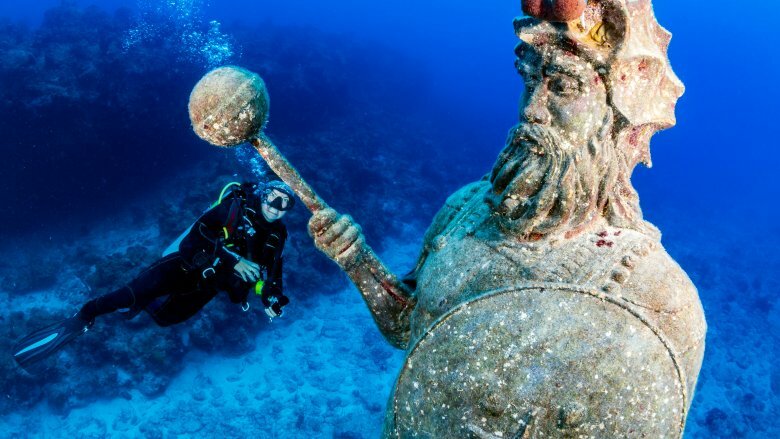 If you couldn't afford property in Miami when you were alive, you can splash out a lot less to spend your death there, thanks to the Neptune Memorial Reef. According to the Miami Herald, the reef is a 16-acre "city of the dead" that will one day hold 250,000 cremated remains. As of 2018, about 600 people's ashes were placed there. It works like this: After you die and are cremated, Neptune mixes your remains with cement and turns it into a mold of your choosing. (Options include seashells, starfish, and turtles.) Or you can be placed in a larger structure like a statue or column. Family members can be mixed together, and even pets can be included. It's very popular with sailors, fishermen, Navy and Marine veterans, basically people who liked the sea when they were alive. And it's comparatively affordable. While a casket for a standard burial on land can start at $5,000, placement in Neptune can be had for around $2,000 at time of writing. The operations director says it's not really a standard burial site; it's a "tribute reef." And it's extremely eco-friendly. The artificial environment makes a great home for all kinds of aquatic animals, including at least one rare kind of sea urchin. The only downside is that your relatives will need to know how to scuba dive if they want to visit you. 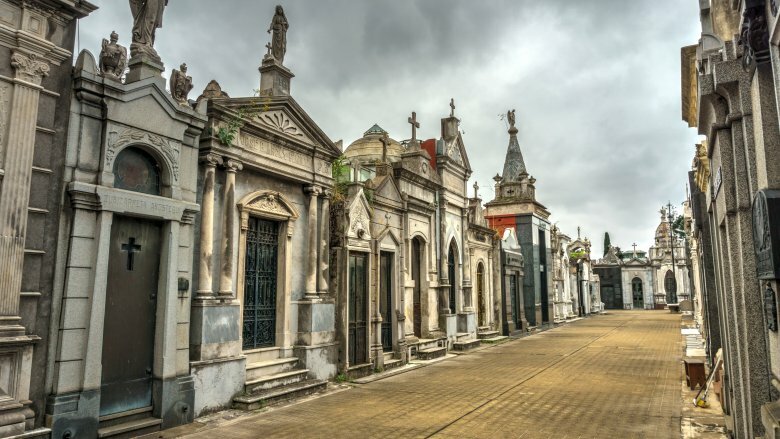 In 1822, Buenos Aires decided it needed an official place to put all its dead people, and Recoleta Cemetery was born. For whatever reason, very few people in the graveyard are buried underground. Instead, it's like an actual city, with streets lined with large, ornate tombs. Culture Trip says it's important to pick up a map when you enter because you could easily get lost wandering among the 6,400 vaults, just like in a regular town with houses full of alive people. Each structure is completely original and there are a wide range of architectural styles, from Greek temples to Baroque cathedrals. It's such an impressive sight that one former grave worker, David Alleno, reportedly saved up his whole life to afford a tomb of his own. He did end up buried there, but Alleno's ghost is said to haunt the cemetery, so maybe he didn't like it all that much. Even more unlucky was Rufine Cambaceres, who was entombed in 1910. But it's said the 19-year-old was less dead than you'd like to be when put in a coffin. Grave workers reportedly tried to rescue her after hearing her screaming, but it was too late. You can still visit her elaborate tomb. But the grave most people go to see is Eva "Evita" Perón. The crypt of the former first lady of Argentina and subject of a popular musical is actually kind of boring looking, but it's "fortified like a nuclear bunker" so her body doesn't get stolen. 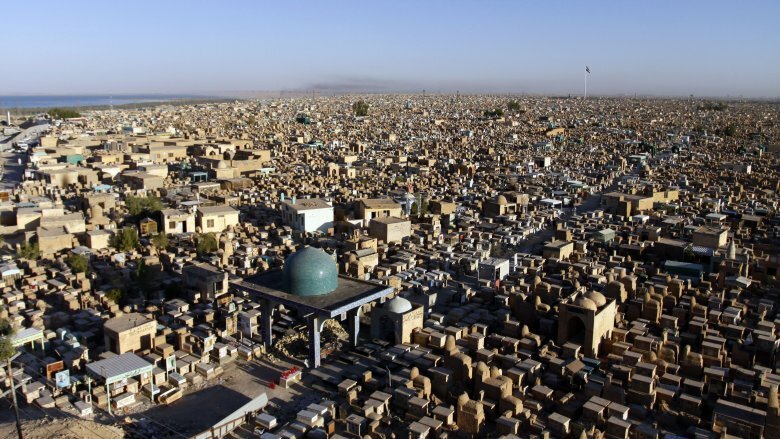 If you've ever been in a cemetery and thought, "This is great but I wish there were more dead people," then you need to get yourself to Iraq. The Wadi Al-Salam cemetery ("Valley of Peace" in Arabic) has an estimated 5 million bodies, according to Ancient Origins. Burials started at Wadi Al-Salam about 1,500 years ago, and they still happen regularly today. While you don't have to be Muslim to get a spot, there are some very famous people of that faith laid to rest there. These include "revered Islamic religious figures, clerics, and political and social leaders" as well as "prophets, kings, princes, and Sultans." The most notable is probably Imam Ali Ibn Abi Talib, the Prophet Muhammad's cousin/son-in-law and first male convert, who ruled the Islamic Caliphate for five years. He got a whole giant shrine in the graveyard, not just a place in a crypt like normal people. The cemetery is still growing every year. Individuals from numerous countries request burial there, as well as virtually every Shi'a Muslim in Iraq. Even if you can't get your body to Wadi Al-Salam, that's okay because there is a Shiite belief that the souls of all faithful men and women end up there eventually. Of course, this being Iraq, the cemetery saw a lot of damage in the past two decades, including the Iraqi army bulldozing down graves. And so many people have been killed in the violence that Wadi Al-Salam is running out of burial plots. The largest cemetery in Japan is so old and awesome that it was made a UNESCO World Heritage Site in 2004. According to Atlas Obscura, Okunoin was originally a temple complex for the Shingon sect of Japanese Buddhism, located on the side of a sacred mountain. Then, over 1,000 years ago, a really important monk died and was buried there. Tradition says that in the millennium since, 10,000 lamps have burned nonstop to honor him. More temples were built, until there were over 100. It became arguably the holiest site in Japan. Of course, other not-so-important people decided this sounded like best the place to be buried. 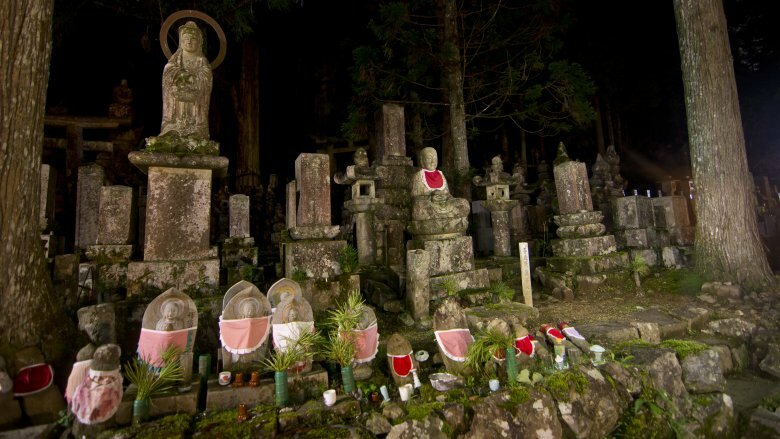 Over the centuries Okunoin Cemetery ballooned to at least 200,000 tombstones. Stuff says it's considered so sacred that companies will buy plots so all their loyal employees' ashes can be entombed there. Some of these corporations have a sense of humor, like the aeronautical company that installed a 15-foot-tall rocket tombstone. Or the large coffee cup for coffee company workers. And it's not just their staff that they might want to commemorate: a pest company built a monument to all its insect victims, while another honors the puffer fish killed by chefs. But not everything in the graveyard is just about death. There are also about 50,000 miniature Buddha statues. A lot of these are dressed up in little red bibs and beanie hats by parents hoping to bring luck to their children. They really stand out against the old, moss-covered tombstones. If you like your graveyards extra creepy, head to Edinburgh. 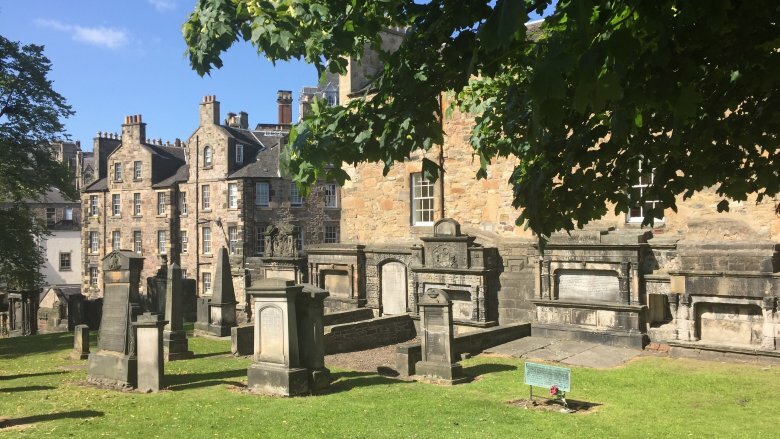 Considered the world's most haunted graveyard, Greyfriars Kirkyard has an interesting history. Right next to the graveyard is a prison that once held 1,200 prisoners in conditions so horrible only 257 came out alive four months later, according to the Daily Beast. Nearby is the burial site of George MacKenzie, who was not a nice guy in life, ruthlessly persecuting people he thought were the wrong faith. He got a mausoleum in Greyfriars when he died, but Robert Louis Stevenson said that wouldn't be the end. The author wrote of MacKenzie, "When a man's soul is certainly in hell, his body will scarce lie quiet in a tomb however costly; some time or other the door must open." Allegedly, this "opening" happened in 1999 when a homeless man broke into the mausoleum. People who've toured the prison and mausoleum have supposedly emerged with visible injuries and broken bones. A newspaper reported in 2006 that there had been 450 documented attacks and 140 people who fainted … all at the hands of the ghost within. But it's not all bad in the cemetery. There is a statue of the dog Greyfriars Bobby, who was said to have laid on his master's grave for 14 years to mourn his owner. (While the dog did exist, the mourning story was probably a marketing ploy.) J.K. Rowling wrote the first Harry Potter just down the street and may have gotten inspiration from the grave of a "Thomas Riddell." 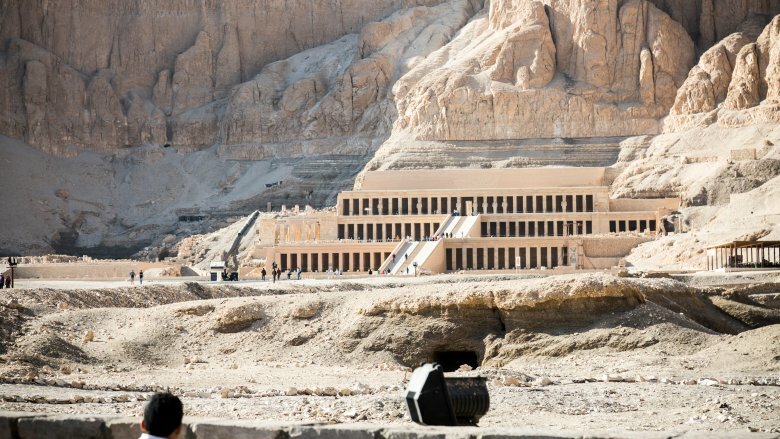 Around 1539 B.C., Egyptian pharaohs realized announcing their burial place filled with treasure to the world via pyramids wasn't the greatest idea, so they started getting buried in the Valley of the Kings. According to National Geographic, for 500 years it was the place to store your remains and all the stuff you'd need for the afterlife, making it a very ancient, extremely exclusive cemetery. Of course, tomb raiders aren't stupid, so the new graves were ransacked almost immediately. That's what made the discovery of King Tutankhamun's tomb so amazing: All the shiny stuff was still in it. Anything else cool that was left in the 64 known graves in the valley was moved to museums long ago. But that doesn't mean it isn't worth a trip to see what's left. However, if you're only dragging yourself to Egypt to get likes on Instagram, don't bother with the Valley of the Kings. No pictures are allowed inside or outside the tombs. If you're cool with just remembering the experience with your mind, though, you'll be following in the footsteps of ancient Greek and Roman tourists. The travel site Landlopers says that each day a few different tombs are opened, and you can walk through the various chambers, marveling at the brightly painted murals on the walls. And there is one thing left to see: King Tut's body was damaged so badly by archaeologists that he can't be moved, so you can visit his mummy still lying in a small coffin.